The School of Computer Science is looking to recruit new academics as part of a large on-going expansion of our academic staff. We wish to appoint two new Lecturers/Senior Lecturers (depending on experience) to join our vibrant teaching and research community that is ranked amongst the top venues for Computer Science education and research worldwide. You will be a scholar with a growing international research reputation in Computer Science and a commitment to delivering high quality teaching within the broad field of Computer Science and its applications. The successful candidate will be expected to have a range of interests, to be active in research publication that strengthens or complements those in the School and to be capable of teaching the subject to undergraduate and taught postgraduate students who come to us with a wide range of backgrounds. Informal enquiries can be directed to Professor Steve Linton (hos-cs@st-andrews.ac.uk) or Dr Dharini Balasubramaniam (dot-cs@st-andrews.ac.uk). Applications are particularly welcome from women, who are under-represented in Science posts at the University. You can find out more about Equality & Diversity at https://www.st-andrews.ac.uk/hr/edi/. The University of St Andrews is committed to promoting equality of opportunity for all, which is further demonstrated through its working on the Gender and Race Equality Charters and being awarded the Athena SWAN award for women in science, HR Excellence in Research Award and the LGBT Charter; http://www.st-andrews.ac.uk/hr/edi/diversityawards/. The School endorses the Athena SWAN charter and is actively working towards recognition. We encourage applicants to apply online, however if you are unable to do this, please call +44 (0)1334 462571 for an application pack. The School of Computer Science is looking to recruit new academics as part of a large on-going expansion of our academic staff. We wish to appoint two new Associate Lecturers to join our vibrant teaching and research community that is ranked amongst the top venues for Computer Science education and research worldwide. Associate Lecturers provide the backbone of our teaching capability, focusing more on the delivery of high-quality taught programmes while still having opportunities for research. You will be committed to innovation and delivery of high quality teaching within the broad field of Computer Science and its applications. The successful candidate will be expected to be capable of teaching the subject to undergraduate and taught postgraduate students who come to us with a wide range of backgrounds. The Associate Lecturer comes with an Education focussed academic promotion track to Lecturer, Senior Lecturer, Professor. Excellent teaching skills and an interest in promoting knowledge exchange are essential. A PhD in a cognate discipline is an advantage, as is industrial or other experience. We are especially interested in individuals wanting to experiment and innovate in improving our student experience. A Research Associate position in analysis and verification of novel cache algorithms is available at the School of Computer Science within the University of St Andrews. The position is a fixed-term position for 18 months, starting January 2017 or as soon as possible thereafter. The project involves understanding and developing the theoretical basis for such algorithms, formalising them using formal techniques of theorem proving and/or model checking, and developing formal analysis and correctness proofs for such algorithms. This is part of the EPSRC-funded “C3:Scalable & Verified Shared Memory via Consistency-Directed Cache Coherence” (EP/M027317/1) project, a collaborative project with architecture researchers at the University of Edinburgh and at Intel Corporation Ltd, investigating high-performance cache coherence protocols. Our goal is to propose and verify a family of protocols that are aware of high-level programming models, including in particular those with so-called relaxed memory consistency models. The particular direction at St Andrews under the direction of Dr Sarkar is to develop verification methods that will scale to the research cache coherence protocols being co-developed within the project. This is a new application area for formal methods, with performance and correctness both equally important. Thus, a background in one or more of Formal Methods, Compilers and Static Analysis, and Verification Tools is expected. Software development and/or formal proof development experience is invaluable. For an informal discussion about the post you are welcome to contact Dr Susmit Sarkar. Applications are particularly welcomed from women and other groups that are under-represented in Research posts at the University. 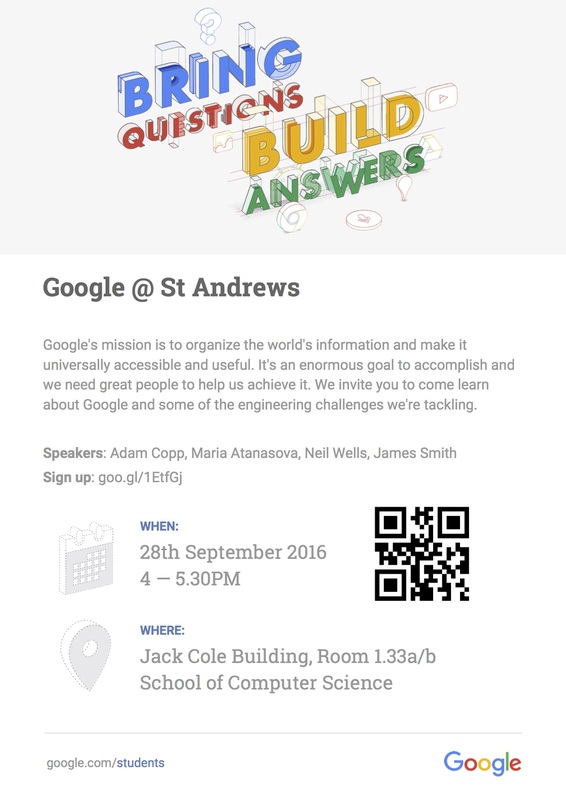 Come along and learn about Google and some of the engineering challenges they are tackling. The event will include talks from our very own CS alumni and mock interview opportunities, which are a great way to get feedback on your interview technique, from real Google Engineers. Pizza and drinks provided. Engineering at Google – 4 – 5.30pm – Presentations from four St Andrews CS alumni working at Google. Q&A session – An opportunity to chat with alumni presenters, and Google interns who are current studying at St Andrews. Mock interview sessions – 7 – 9pm – Interested people should sign up using the link above. An internship is available, working with Alex Voss on a digital journalism project involving social media analysis to inform a weekly radio show on BBC 5Live. For details, see the internship ad. If you have any questions please get in touch by email. The deadline for applications is 18th July 2016. Applications are invited for 2 Teaching Fellowships in the School of Computer Science. In the first instance, at least, these are fixed-term positions of ten to twelve months with a start date of August 2016. We require Teaching Fellows to assist with the development and delivery of high quality, innovative teaching. Applicants should have at least a BSc in Computer Science, preferably a PhD, and previous lecturing and tutorial experience at undergraduate level. Preferably they should also be able to demonstrate ability to deliver a range of core Computer Science courses, in classroom, laboratory and small-group tutorial environments. Experience in project supervision at undergraduate and masters level would also be beneficial. Candidates are welcome to make informal enquiries to the School’s Director of Teaching, Dr Graham Kirby, dot-cs@st-andrews.ac.uk. For further information about the School of Computer Science, please see the further particulars. We seek applications for 2 lectureships in Computer Science. We welcome applications from excellent researchers who have a strong research background and excellent publication record in any area of computer science and a commitment to excellent teaching. These are fixed-term posts, lasting three years, however the School’s student numbers are currently growing rapidly, and if this is sustained we expect a number of permanent lectureships to open up over the next few years. Candidates interested in this post are welcome to informally contact Steve Linton hos-cs@st-andrews.ac.uk or Dharini Balasubramaniam dot-cs@st-andrews.ac.uk to discuss possible options. Applications are particularly welcome from women, who are under-represented in science positions at the University. You can find out more about Equality & Diversity at https://www.st-andrews.ac.uk/hr/edi/. The deadline for applications is Friday 13 May. The deadline for applications is Friday 6th May.